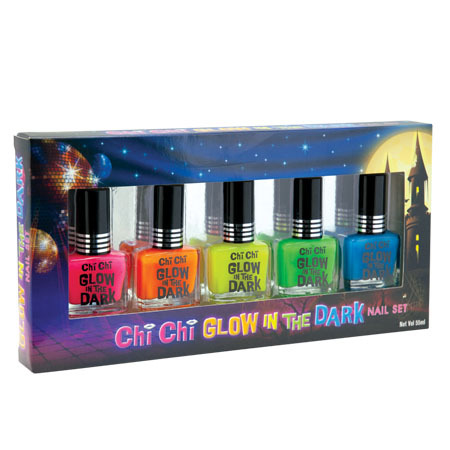 gift set containing 5 glow in the dark nail polishes in gorgeous must have shades. Enjoy! Ingredients: butyl acetate, ethyl acetate, nitrocellulose, phthalic anhydride/trimellitic anhydride/glycols copolyner, acetyl tributyl citratte, isopropyl alcohol, silica, citric acid, pigment may contain: ci 42090:2, ci 45410:2, ci 15850:2, ci 47005:1, aluminum oxide, strontium oxide, eur opium (iii) oxide, dysprosium oxide, boric anhydride, amorphous silica.